This file defines prefabricated reports which are emitted in case of MPI related bugs, detected by path-sensitive analysis. 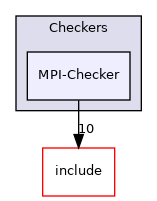 This file defines the main class of MPI-Checker which serves as an entry point. This file defines functionality to identify and classify MPI functions. This file provides definitions to model concepts of MPI.